Most of the contents of this guide is based off personal experience and testing or information that has been mentioned across the many sorcerer and necromancer threads around. Feel free to correct me for any wrong/outdated information or let me know if you want me to credit any particular tidbit of information by replying the original source. The Summoner trope is alive and well in the world of ToS and is arguably the most versatile in the Wizard tree when it comes to what it is capable of. The main and unique appeal of summoner classes (purple icon) is quite obviously the ability to create and command minions that have some degree of autonomy while the player does their thing. A variety of summoner builds can also fit in to several roles ranging from crowd control, to support and maybe even off-tanking while being a DPS by default. The purpose of this guide is to consolidate summon and summoner related information, as well as to enumerate the various skill synergies and interactions related to the summoner classes. Click the ► to expand the sections with the information you are looking for. Bolded sections are already expanded. Summon Base Attack is determined by its base stats, level scaling and [★] scaling for Demon Summon and Shoggoth. Weapon Matk only includes the actual weapon’s attack (with enhancements, transcendence, Squire maintenance and blue gems slotted in the weapon included). It does not include the character’s base matk, int bonuses and other matk bonuses from equipment. The total attack enclosed in the [ ] is still subject to the attack vs. defense formula. I am unsure of where the SPR and Attack SFR multipliers fall within the overall damage calculation formula. Health and Defense: Summon HP and def values scale with the summoner’s stats. I have not come across any official formulas for it. Other Stats: Summons seem to have their own crit rate, accuracy, evade and block values, they are unaffected by how much you have of these stats. AFK prevention: Most summons have a built in internal timer that prevents them from attacking if the summoner has not attacked after a certain amount of time (around one minute). Using Macros and automated input to bypass this AFK prevention mechanic can be considered botting and is generally frowned upon. FAQs: Is a summoner build viable? Is it meta? Yes, summoners are viable but they fall short of being top tier meta. I’ve tried almost every class and the only reason summoner classes are not meta is cause they are balanced. Summoners simply don’t have that one overpowered skill that makes them unkillable, or mega laser cannons, or raise the entire party’s strength 3-fold, or make the party unkillable, among other things that made a few select classes meta picks. On the other hand, summoner classes only fall short in PvP and are above average or even top contenders in pretty much all other content ranging from dailies, to farming, to raids and even world bosses. FAQs: Do summoners require a lot of investment? It does, but not as much as full DPS or full PvP builds. Summoners don’t have a lot of enhancement attribute points, which is what ultimately pushes piano DPS classes into god tier carries. Summoners have a few key investments such as cards and specific equipment, but beyond that they don’t need to pour as much just to keep up with end game difficulty. FAQs: What 3rd class do I pick? There are recommendations in the Build Templates section of this post but if you really love to play as a summoner try all three purple icon classes first (doesn’t have to be the same character). If there’s one of them that you’re absolutely sure you won’t like, then feel free to try any other wizard class you are interested in. One of the biggest features that Re:Build brings to the game is the ability to swap out classes every now and then. It’s near impossible to permanently break your character, and even if you feel like you did you can at least pull out the attribute point investments you’ve made for the benefit of the next generation. FAQs: Will summons make people lag? Will I get removed or blocked from parties? Summons are just about as processing heavy as any other mob or boss monster. Of course if there’s too many of them from too many people it will lag, but the same can be said for any other class skills and effects. As for server overload leading to channel crashes, the primary culprit would be having too many player characters or sudden and massive amounts of damage calculation, which summons basically have nothing to do with. If anyone is telling you to take off your summons because it makes them lag, tell them to either lower their graphic settings when playing content that involves multiple players or to go and ask IMC to fix their potato optimization. There are possible reasons for a summoner to screw up or delay certain raids or mechanics though, mostly due to the auto attacking nature of summons. If it’s your first time running a raid let your party know and ask them to tell you if they want summons turned off on certain parts of the run. The most straightforward summoner class, command an army of undead to attack enemies. Summon the right minion for the right job by utilizing a variety of skeletons that each have their own attack type and fighting style. Boost the offensive potential of your army and yourself through the Shoggoth, which corrupts nearby enemies increasing the potency of physical and fire spells against them. The Necromancer is the most reliable and most consistent DPS summoner, capable of providing offensive power in any PvE content. Summon one skeleton per cast that lasts 300 seconds. Skeleton Soldiers deal dark physical damage, have the fastest attack speed and the highest health. Skeleton Archers (Class lv. 16+) deal dark physical damage and attack from range. Skeleton Mages (Class lv. 31+) deal poison magic damage, attack from range, and occasionally casts [Flesh Strike], an AoE attack which debuffs enemies with 10 [Necromancer Bane] stacks on hit. Mages also cast a buff when summoned that prevents knockback and knockdown for summons that last 30 seconds .Only 5 skeletons total can be active at a time. Summons a tanky tentacle monster that has high health, provokes enemies, deals dark physical damage and occasionally uses a breath attack that hits enemies in a cone in front of it. The [Create Shoggoth: Corruption] grant it a debuff aura that lasts up to 5 minutes which inflicts [Corruption] to nearby enemies boosting their physical and *fire damage taken. Requires a Beast, Plant or Mutant card in the Necronomicon to cast. *a future patch will change [Corruption] bonus damage for fire to bonus damage for poison instead. Summons an immobile glaring eyeball tower that lasts for 30 seconds and deals poison magic damage through rapid long range attacks. Attacks hit enemies in a line. Recommended skill allocation: Max [Create Shoggoth], max all Skeletons (or one favorite to allow spending points on other skills, at the cost of adaptability), max one or both [Flesh Hoop] and [Flesh Cannon], 1 or 0 points [Gather Corpse] and [Disinter], and remaining points on [Corpse Tower]. Skeleton Soldiers have the highest DPS assuming constant attacking conditions. [Necromancer Bane] boosts Skeleton damage by 1% per stack, alternate [Flesh Hoop] and [Flesh Cannon] to keep max stacks up on a boss. Skeleton Archers and Mages tend to stick close to the summoner, so avoid using them when facing off against bosses that have targeted AoE attacks like Mirtis’ lightning bolts. Runecaster’s [Rune of Giants] will also apply on Shoggoth. Unforunately, aside from visuals the buff is nothing big. Gain control of one big bad summon while the rest of the kit acts as the glue to bring summoner builds together. Keep your summons alive with the healing aura attribute for Salamion, use spells that boost summon damage and even summon a cute kitty that provides useful buffs like increased SP regen and additional AoE Attack Ratio for your party. Sorcerer is best paired with another summoner class to maximize its skill set. Summons the Demon-type boss cards in your Grimoire. [Summoning] will bring out the demon in the 1st slot. [Morph] will replace the initially summoned demon with the one in the 2nd slot, while retaining the stats of the previous one. The summon from these skills will only use its “A” skill otherwise known as the auto-attack, but you can cast [Riding] to take control of it and gain access to a skill bar that lets you use several skills unique to each demon. Summons a fiery blob with horns that lasts for 300 seconds and deals magic type damage. It’s kind of clumsy as a summon, but the [Summon Salamion: Ignite] and [Summon Salamion: Blind] attributes allow it to inflict debuffs. Another attribute [Summon Salamion: Heat] grants it a healing aura for your summons based on its own max HP. Higher skill levels increase the HP of this summon which also improves its healing ability. Summons a black cat that briefly follows and casts buffs that last for 300 seconds, affecting the summoner and party members nearby. The most useful buffs are [+SP recovery speed], which reduces the time between ticks of natural SP recovery and [+AoE attack ratio] which gives +5 AoE Attack Ratio allowing most attacks to hit more targets. The [Summon Servant: Quick Order] attribute will make all the buffs the cat can use apply instantly. Although technically a summon because the bats follow you around when cast, they should be treated more like a spell because they blow up after one attack. Recommended skill allocation: 0 points in Summon Familiar, Max Everything else except Salamion, remaining points on Salamion. Each Demon summon has their own set of skills accessible through the [Riding] skill. If an update adds more Demon type cards, Sorcerers will also be able to acquire new summons with new skills. Leveling Salamion will increase the heal from its [Summon Salamion: Heat] attribute, level 8 is not enough to beat out the HP drain from [Summoning: Overwork] but it’s more than enough to keep it alive for over 5 mins. [Desmodus] and [Evocation] additionally scale off SPR, just like summons. The attribute [Summoning: Overwork] provides a decent damage bonus but the SP drain is not sustainable without certain buffs. Place it in the hotkey bar and only turn it on for things like World Bosses or PvP/GvG if you don’t want to drown yourself in SP pots. Alternatively, Squire food buffs or Dievdirbys [Statue of Goddess Zemyna] buff stacked with cat SP regen speed buff will allow natural regen to sustain it. Sage’s [Micro Dimension] with the attribute [Micro Dimension: Duplicate] will only work on Familiars as far as summons go. It doesn’t work well because the clones will disappear when the original Familiars blow up. Resummoning a demon by recasting [Summoning] or using [Morph] will refresh the cooldown of their skills. The UI will show that the skills are still on cooldown but they can be used. The aiming behavior of summons while [Riding] is now based on where you are facing instead of auto-aiming towards the nearest target. There are still certain attacks that auto-aim like Corrupted’s auto attacks. [Riding: Increase Stats] attribute is relatively cheaper to max out compared to other enhancement attributes but it does not have an additional 10% bonus at cap. Sometimes it’s possible to get stuck on top of your Demon while attempting to ride it, in cases like this throw a normal attack to unstuck. A hybrid summoner-spellcaster class that generates zombies from defeated enemies. The zombies are then blown up to defeat enemies and create more zombies. Requires an active play style if you want to make full use of the class, but the summons will still pick up your slack if you’re feeling lazy. Bokor is the strongest summoner class when it comes to content that deals with a lot of enemies like challenge mode. Applies a debuff to enemies around the caster, which will cause zombies to spawn when they die. The zombies deal dark physical damage and also apply the zombify debuff when they attack an enemy. Zombies generated through zombify scale off the defeated enemy’s stats, making them stronger when you are in more difficult content. The attributes [Zombify: Wheelchair Zombie] and [Zombify: Large Zombie] allows variants to spawn from medium and large enemies respectively. These variants have different stats but are generally stronger, faster and tougher than a regular zombie. Maximum of 8 zombies at a time. Recommended skill allocation: Max [Zombify], Max [Samadiveve], Max or 0 points in [Damballa], Max or 1 point in [Hexing]. Everything else is up to preference. Feels a bit gimped if there are no mobs to turn into zombies. [Zombify] can be used on [Ice Wall] to spawn zombies. 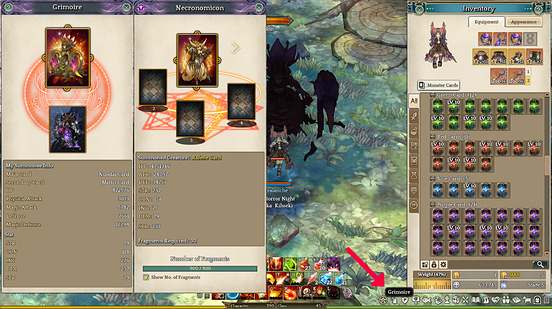 A demon type card needs to be placed on the 1st (upper) slot in order to use the [Summoning] skill. The summon will be a purple version of the boss that uses its own unique attacks and has its own set of skills accessible through the [Riding] skill. Another demon type card needs to be placed in the 2nd slot to use [Morph] which will summon a black version of the boss in this slot by replacing the one summoned through [Summoning] while retaining its stats. [Evocation] also requires a card in the 2nd slot to use. The demon in this slot will briefly show up and then explode when the skill is used but there is no difference between which card or what level it is aside from visual effects. Go to https://tos.neet.tv/npcs and search the names of Demon type bosses to look up their stats as summons (check the ones that have pc_summon in their class name) . Expand the skill section to check the attack type, attribute and SFR of Grimoire summon attacks. In this example, you can see that Marnox does strike type physical attacks but its D skill is fire type magic. Knockdown Summons: Lavenzard and Tomb Lord to name a few. Lavenzard is useful for closed room CM spots like in Spell Tome Town, while Tomb Lord’s attack is more inclined towards PvP due to its large attack range with auto targeting (it fires an explosion at three targets in front of it). Succubus: One of its skills have a vacuum effect with a fairly lengthy range. Useful for grouping the mob pull at Velcoffer’s 2nd statue portion. Stationary Summons: With the removal of the [Hold] command you can’t leave a Demon at one spot for whatever reason anymore except when you use a stationary type. A decent summon of this category is Pyroego with its large aoe auto attack with a mini knock back and fairly decent riding skills. Stationary Summons materialized with [Morph] will teleport to you if you move too far, unlike those summoned with [Summoning] which will stay in place. A beast, plant or mutant type card needs to be placed on the 1st (upper middle) slot in order to use [Create Shoggoth]. It doesn’t matter what card you use and what the stat window in the Necronomicon says, currently it has no effect on actual Shoggoth stats. The other card slots are remnants of an old system that was meant for Shoggoth, but was scrapped and now holds no purpose aside from confusing unknowing players. 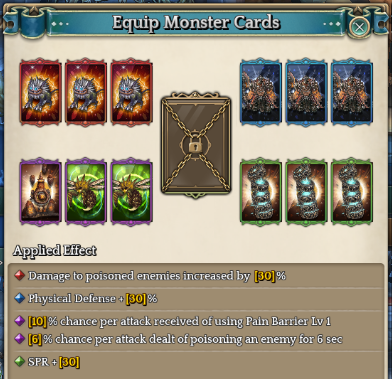 [Summon Shoggoth] tooltip indicates a 5% per [★] scaling for atk and def but there seems to be no difference between a 1[★] and 10[★] card upon personal testing. On the other hand, there is a slight difference in damage between a 1[★] and 10[★] demon card in the Sorcerer’s Grimoire but it is also negligible. The differences may be more noticeable at lower levels or with lower equipment investment. Obtaining cards for [Summoning]: I wouldn’t recommend having a first ever character on a fresh account as a summoner due to market restrictions making it difficult to acquire cards. However, obtaining a card is the first order of business for a Sorcerer so here are some ways to obtain the cards you are looking for. Accounts that don’t have access to market yet have no choice but to try and look for cards from [Underground Chapel Dungeon] and [Historic Site Ruins] leveling dungeon cubes. Very low drop rates from Request Office Missions. Equipment milestones in order of priority and accessibility. High matk main weapon. Staff for max damage but rod and shield is currently better overall due to the defense and stat bonuses as well as the reduced cast time attribute from the base Wizard class. [SPR >>> CON > HP/PDEF >> MDEF > SP recovery > Max SP] order of generic stat priority in gear. 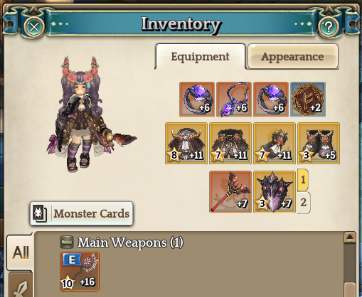 Rangovas Accessory Set from Fantasy Library raid for additional HP and Def necessary for summons to survive in endgame content like World Bosses and Velcoffer. Just having the necklace alone prevents your summons from being knocked back or knocked down, greatly improving their performance. Asio Rod or Masinios Rod and Wastrel Zvaigzde Shield to swap into while summoning to maximize and “snapshot” (explained in section VII) SPR, HP, pdef and def bonuses. Blue Cards: Zaura for PDEF or Nuaele for MDEF. Armaos for survival. Purple Cards: Yeti for HP. Gazing Golem for [Pain Barrier], Marionette for minor CC from your own spells and attacks, Biteregina or Rajapearl to combo with Velnia/Prison Cutter respectively if you use them. Legend Cards: Froster Lord, Rexipher, Zaura or Nuaele BUT Legend Cards are incredibly difficult to level up past 4[★] so the best card here really depends on playstyle and is not even necessary outside of min-maxing. VII. Build Synergies, Tips and Tricks etc. The “Snapshot”: The SPR damage modifier is only calculated upon summoning, while the weapon matk calculation is dynamic. This means that you can switch to a full SPR equipment set and snapshot your SPR through summoning, then switch to your main weapon afterwards to maximize summon damage. The Rangovas Set bonuses can also be snapshot. Summoners have access to all types of damage for World Bosses. Use Physical summons like Marnox, Riteris and Skeleton Soldiers or Archers against Physical-weak types, Magic summons like Froster Lord and Skeleton Mages as well as your own spells against Magic-weak types and lastly use [Enchant Fire] (can be scrolled) on rapid attack and multi-hit summons against Property-weak types. Pair Necromancer with fire casting classes like Pyromancer to reap the benefits of [Great Corruption]. Summons are also affected by [Enchant Fire] and having high SPR will increase the effectiveness of the buff at the same time. Pair Bokor with dark casting classes like Warlock and Shadowmancer for the bonus damage from [Hexing:Dark]. Sorcerer spells like [Desmodus], [Evocation] and [Summon Familiar] are also dark property. Non-summoner class skills that boost summon damage include Pyromancer’s [Enchant Fire], Psychokino’s [Gravity Pole] with the [Gravity Pole: Decreased Defense] attribute and Rune Caster’s [Rune of Destruction] for magic type summons. The builds in this section are only meant to guide, with a brief description of play style, strengths and weaknesses and other stuff that might be good to know. Class hyperlink leads to suggested skill allocation (free points are up to preference). Strengths: Huge army, multiple damage types, lots of damage multipliers, chill PvE. Weaknesses: Defenseless in PvP, spammy skills, no CC aside from knockdown, summon reliant. Resource, SP and summon management. Description: The full blown summoner. Command an army and stack multiple summon damage multipliers on bosses to watch them be reduced to nothing. You will either be permanently riding your summon or spamming tons of debuffs and low cooldown bokor skills. Strengths: Multiple damage types, good at general PvE (can CC, can AoE, can single target DPS), good skill rotation. Weaknesses: Defenseless in PvP, lots of ground targeted skills to aim. Description: My personal build and main. Use the different kinds of skeletons and demon summons to adapt to the content you are doing. Utilize your high SPR by applying [Enchant Fire] to boost the damage of summons and multi-hit spells from pyro and necro. There’s good cooldown between skills which makes for a comfortable window that fits [Hell Breath] and [Riding] skills. Strengths: CM powerhouse, dark-magic damage based, can do a bit of zoning with ground targeted spells and DoTs. Weaknesses: Reduced damage against a majority of end-game bosses due to doing mostly dark damage, low CD skills require some set-up, needs mobs to kill for stronger zombies. Description: Becomes exponentially more powerful with more mobs to kill, making it ideal for clearing Challenge Mode. Can easily solo closed room CM locations like the spot in Spell Tome Town by using knockdown demon summons like Lavenzard and then spamming both Invocation and Damballa to dish out a lot of damage. Bwa Kayiman is surprisingly useful as well, as it can CC and apply DoT with almost no down time. Most of your damage will be Dark and Magic based, so be sure to keep [Hexing] up on priority targets like elite mobs and bosses. Strengths: High survivability, high mobility, self-sustaining, core skill focused. Kihseki note: I would take some points off of [Hexing] and max out [Samadiveve] for the movespeed as a personal preference. Weaknesses: Less synergies than the above build templates. Description: This template is more for people who already invested in a Summoner and have all the SPR gear and the Rangovas set lying around. You can pick anything as a 3rd class with Necromancer-Sorcerer being the safer general template while Necromancer-Bokor being more inclined towards DPS classes. Like CC? Go Cryo or Kino. Want some damage? Pick your favorite DPS class like Taoist. Support? Alchemist or Chrono. Some of these picks will be better than others, but don’t let that stop you from coming up with your own blend of summoner. Necromancer build question: which skeleton skill to pick? Is taking necromancer still viable? Best summoner class for a new player? Recent changes: Updated with content from March 12 maintenance. Mostly just finalizing the description for skull mages and adding the Shoggoth’s new provoke to its description. Also added note for future update regarding Corruption change from fire damage synergy to poison damage synergy, and the changes to Hexing: Dark attribute. Removed the Onmyo-Kino-Necro build from the templates because it’s not future proof. Will do the same for Pyro-Necro-Sorc when the adjustment for corruption hits, probably. Planned updates: Will update when upcoming rebalance patch for Corruption, Featherfoot and Bokor hits. Thanks for the post, having all this information in one place helps a lot. I’m a bit confused by the SPR multiplier formula. Does level refer to the skill level or the player level? Based on the formula, it seems like being higher level decreases the SPR multiplier scaling. Is that correct? I believe it refers to character level, and yes you are correct; higher levels mean the SPR multipler actually becomes harder to raise so having up to date and maxed out SPR gear is important at level cap. The default stat spread generally keeps base SPR at around character level and higher level gear give higher SPR bonuses so at the very least the formula makes sense in a way that it doesn’t allow the multiplier to be below 100%, and that it also doesn’t allow it to blow up exponentially. but as for them alone i got a question in what do you think about necro-Onmyoji-taoist? do you think is really necessary to play necro with pyro to play with the greater corruption? do you think if i trade necro for sorc the build would work better? Pyro is not necessary, it’s just one of the classes that Necromancer has synergy with. The skill interactions I pointed out are only there to provide ideas in making builds. Necro has more DPS potential than Sorcerer just from attributes alone, but as classes they compliment each other really well so it’s never a bad idea to have both of them in a build. Each of the summoner classes can hold their own (Although Sorcerer is leaning more towards the support side) so feel free to mix and match with other classes. For Necro-Onmyo-Taoist I don’t really see any major synergies between the classes. Tri-disaster charm will help a couple of Onmyoji skills but that’s about it. Onmyoji is a strong AoE class while Taoist is a strong Bossing class though so I guess you won’t really feel lacking at anything, but I doubt it will excel at any one thing either. You should post all possible builds that make good synergies, and divide them like “best farming, best dps” (IE: im currently necro/sorcerer and i dont even know what to choose for a solo player) and btw good post! Very well put together thread! Thank you. As someone who is a lover of summoner + dps hybrid builds, I’ll be checking this thread out often. Sharing my Necro FF Bokor build, just because. Masinios Rod only has a base SPR of 122, but has an effect that can grant you an extra +50 SPR, so it would have +172 SPR in total. Thanks for the great work on the guide, liked and bookmarked for later reference. Sorry, I forgot to mention this one, but the same can be applied for Linkroller card vs. Lavenzard card for green card slot as well. Linkroller gives you +30 SPR permanent, while Lavenzard gives +45 SPR temporarily for 10s after you pop an SP potion. If your motive is solely for “snapshotting” the highest SPR possible for summon, 10s should be enough to do the trick. 15 SPR difference doesn’t sound much, but sometimes it makes the difference between one-shotting a bunch of monster or having a couple of them left alive with 1-2k HP and have them hit back on you/your summon before they receive a second blow. Masinios Rod does give more SPR but Asio Rod also gives MDEF. There’s also the issue of having to charge the stacks for SPR and needing to be able to summon within the timeframe of the buff. I will add it along with Lavenzard Card in the suggestions though as they are perfectly viable just as you pointed out. Thanks! @Tankhime I will be adding your build with credits to you when I get to the builds section. Thank you! Do you know if Bokor’s Hexing: Dark attribute applies to curse inflicted by featherfoot skills? For Bone Pointing’s curse, it doesn’t apply. But it does apply for Kurdaitcha’s curse, now. The reason I didn’t max Samediveve was because zombies now apply a debuff to monsters, that if they die while it’s active will always spawn a fresh zombie. Since fresh zombos have to wait for the next Samedi buff… it’s a very short-lived buff for the zombies themselves, and doesn’t help them kill quicker because they lose it. It’s still really great if you use it for the hp and movespeed for your own character, though. I just don’t need the Hp. I also max Effigy instead of Hex, because I tend to use Kurd -> Effigy instead of Hexing in mobbing situations. But maxing Hex instead is a much more preferable option if you don’t pick FF as a class. Some info about skill gems and their viability would be nice. Good call, though it might be a bit hard to test since I don’t have all of them. For example I’ve tried using the summoning gem but it seems to cap at level 15 making it useless. Salamion Gem is easy to get and good to have for boosting its hp and heal though. Hmm, in the past you could go over the cap lvl, if it’s no the case anymore then sux. Sorry apparently I tested it when my UI got bugged and was frozen. I checked it again and it went to level 16 properly. @Tankhime I guess it makes sense to take out points from hexing instead for samadiveve, I changed my note about it. Thanks! I assume that 15>16 summoning is 2% difference? Yes, additionally the levels in Summoning itself only affect the base stats so it’s really not a big boost. The biggest bonus comes in HP, assuming it behaves similarly with Salamion. Desmodus and Evocation should be worth gemming for stronger multipliers and increased duration respectively. But you can always put summoning and salamion in the shield/weapon that you are using for snapshot summoning. Unless for some reason it will not work.